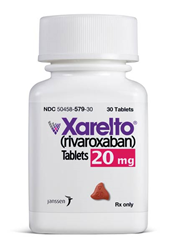 Several Xarelto users are considering filing a Xarelto lawsuit after suffering dangerous side effects associated with the popular blood thinner drug Xarelto (rivaroxaban). The Levin, Papantonio law firm has launched a Xarelto lawsuit website to assist those who have been injured from severe internal bleeding experienced after taking the blood thinner drug. If Xarelto’s manufacturers would have provided patients and doctors with the information necessary to identify users at an increased risk of a bleeding event, several serious or fatal bleeding events in Xarelto patients may have been avoided. Users of the prescription drug Xarelto (rivaroxaban) are beginning to file Xarelto lawsuits after allegedly suffering severe and deadly side effects* from using the popular blood thinner. In response to the growing litigation**, the Levin, Papantonio law firm has launched a Xarelto Lawsuit information site to assist those seeking to potentially file a Xarelto lawsuit after suffering injuries. The website provides extensive information on the Xarelto litigation, frequently asked questions and answers, and a free case evaluation for users to submit their situation details for a free review from a Xarelto lawyer. The popular prescription anticoagulant Xarelto is manufactured by Janssen Pharmaceuticals, a subsidiary of Johnson & Johnson, and belongs to a class of drugs known as factor Xa inhibitors. Xarelto works by thinning and decreasing the clotting ability of the blood, aiming to help in the prevention of blood clots and stroke. In July 2011, Xarelto was introduced to the market and has grown to be a popular alternative blood thinner over warfarin (Coumadin), a much older anticoagulant drug. Xarelto has been vastly prescribed to thousands of patients suffering from atrial fibrillation (arrhythmia where blood pools in the heart), deep vein thrombosis (blood clots deep in the body) and pulmonary embolism (blood clots in the lungs). It has also been approved for patients undergoing knee or hip replacement surgery to prevent the development of dangerous blood clots. Xarelto lawsuits are currently being filed after several individuals have allegedly suffered severe and irreversible internal bleeding from taking Xarelto, which can be a potentially life-threatening and require extensive treatment and hospitalization. “If Xarelto’s manufacturers would have provided patients and doctors with the information necessary to identify users at an increased risk of a bleeding event, several serious or fatal bleeding events in Xarelto patients may have been avoided,” commented Ned McWilliams, a shareholder and Xarelto lawyer with the Levin, Papantonio law firm. The Levin, Papantonio law firm is currently investigating Xarelto cases where injuries were suffered from internal bleeding caused by the use of Xarelto. If you or a loved one were affected by the dangerous side effects of Xarelto, or your loved one died as a result, you may have a case to file a Xarelto lawsuit. Please do not wait to contact us for a free case evalution of your situation. Since opening its doors in 1955, the law firm of Levin, Papantonio, Thomas, Mitchell, Rafferty & Proctor, P.A. has handled many cases in mass tort litigation and personal injury, and settlements and verdicts won by the firm have exceeded $1 billion. In 2002, Levin, Papantonio was recognized by the National Law Journal as the fourth most successful law firm in the country. The firm specializes in various litigations, including products liability, personal injury, car accidents, and defective drugs and devices.